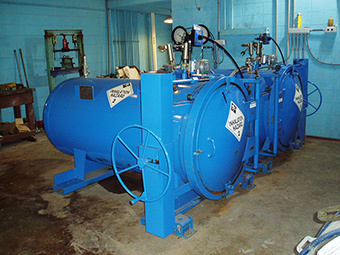 The chief operator for the City of Morgan, LA, water treatment plant (WTP), which has safely used chlorine gas for disinfection for over 30 years, reports an added boost to public safety through the installation of special secondary containment equipment, while easing regulatory compliance efforts through their risk management plan (RMP). He added that the equipment provided for an automatic shutdown of chlorine feed in the event of a leak, and that it was not a problem for unskilled operators to use it properly. The average 4 MGD plant has an annual flow range of 2.5 to 6.5 MGD. Two one-ton ChlorTainer™ containment vessels, supplied with loaders, scale systems, and instrumentation, were manufactured by TGO Technologies, also known by its product name of ChlorTainer, of Santa Rosa, CA, and installed in 2007. The maintenance on the vessels requires less than 5 minutes of time and under $200. The vessels’ life expectancy is stated as no less than 100 years of service with proper maintenance, which includes changing out the Viton O-ring on the door. The maintenance on the vessels requires less than 5 minutes of time and under $200. 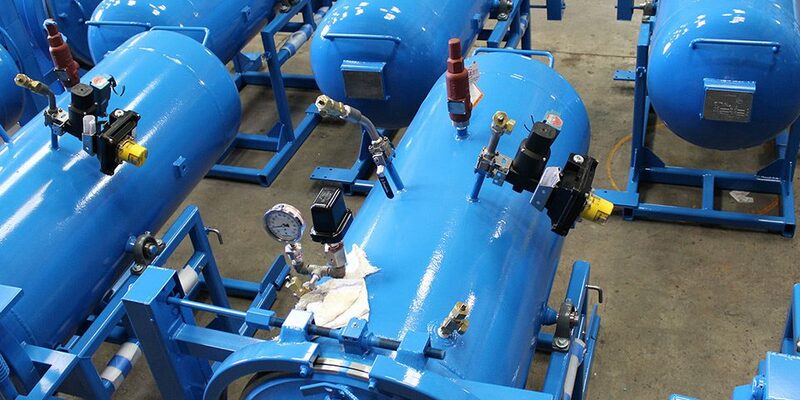 The vessels enclose chlorine gas cylinders, the chlorine transfer hose, and seismic lock-down brackets. The chlorine transfer hose is attached to the supply valve, pressurized, and tested for any leaks at the hose ends. Then the door is closed and secured by a clamshell locking mechanism. Operators switch to the standby containment vessel automatically when the full cylinder runs empty, opening the vacuum breaker valve. The switch-over is performed automatically and does not require personnel to be present. With any accidental leaks of chlorine kept within the containment vessel, no atmospheric venting is generated. The vessels are ASME-rated pressure tanks, and any leaks are recycled to the injection system at a normal flow rate. A failsafe valve ties into the chlorine leak detection sensor, so that in the event of an external release, the nitrogen failsafe valve will close, stopping any external leak. To test for leaks within the containment vessel, there are built-in redundancies (two visual and three physical tests) to ensure the operators are not exposed. 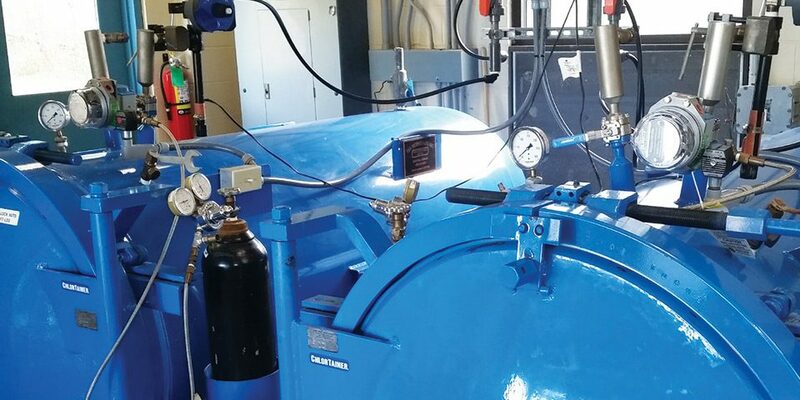 If a leak is discovered within the containment vessel, the operator can withdraw the chlorine gas through a vacuum line that delivers the gas into the treatment process. Thus, chlorine gas leaks are not only contained within the containment vessel, but the gas can also be extracted, and delivered via the typical chlorine feed system. Any leak or release of chlorine gas from the vacuum line downstream of a vacuum regulator will lose the vacuum condition, and cause the vacuum regulator to close, stopping the flow of chlorine gas to the vacuum line. The maximum release of chlorine gas will be the amount of chlorine gas that is the length of the vacuum line to the chlorine injector, and not drawn into the water solution by the suction of the injector. There can be a question of the integrity of the system from the outlet line, where chlorine gas penetrates the wall of the pressure vessel, to the location where the vacuum line leaves the outlet side of the pressure regulator. A study has shown this could release less than 0.0009 lbs. of chlorine gas. Should there be a gas leak inside a ChlorTainer™ vessel, there is no waste, as the gas is processed at a normal rate until everything is used. 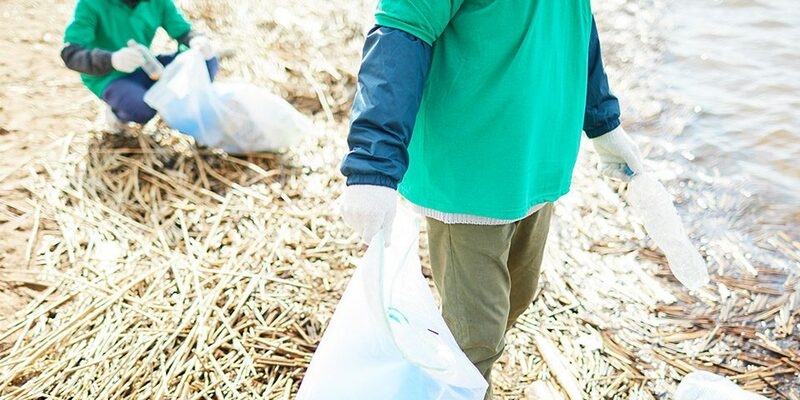 In a further commitment to serving the water industry, ChlorTainer is partnering with the American in civil and environmental engineers and encourage their entry into that industry. For every ChlorTainer unit sold, the company will donate $1000 toward engineering scholarships. The donation will go to the corresponding AWWA Section scholarship fund for the municipality that purchases the ChlorTainer(s). Further information is available via the AWWA scholarship page.